These healthy, happy, and well-socialized kittens are all at least 12 weeks of age to ensure they are ready to transition to a new home. These older kittens (which we light-heartedly call "teenagers") are perfect for homes with younger children because they're more mature, self-reliant, and resilient. We always try to keep in mind what's best for our cats, and sometimes that means letting go of adults who have been with us for a while. These retired adults are available to approved homes who will give them a wonderful retirement full of love and spoiling. 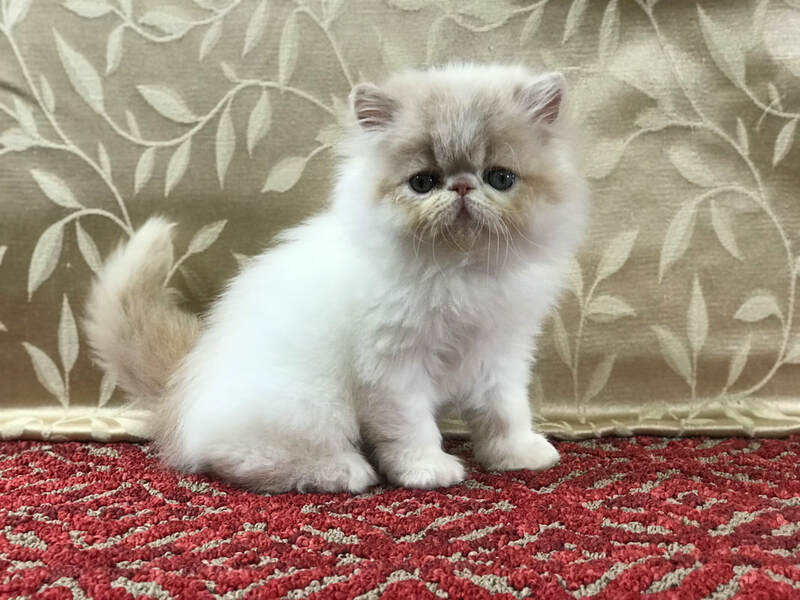 These cats have exceptional qualities that make them worthy of the show ring or as an excellent breeding cat to advance the breed. What is the difference between pet, breeder, and show quality cats? The answer to this question will vary from breeder to breeder, but here is our answer. Pet quality cats are cats that do not meet the written standard in some way and/or have some fault that would not make them a good cat for a breeding program. In many cases, they are nice quality cats, but they aren't "good enough" to be kept whole and to contribute to a breeding program. We strongly believe that only the best cats should be used in breeding programs - the rest make wonderful pets for people to own, be owned by, and loved. (Which is why it's very important to us to have sweet-natured cats, as well as healthy lines). Just because a cat is "pet quality," it does not mean they are 2nd class "kittycats" - just that they are not what the written standard calls for, so they shouldn't be used for breeding. Breeder quality cats are, to us, cats with no major faults, but over all have something to add to a breeding program. Oftentimes, cats that we feel are "breeder" quality can be shown and even win some at shows, but they are not the level we consider to be "show quality." ​I've read that I should tour the cattery that my kitten was raised in, as well as see the parents, is this true? This is one major area we tend to detour from the commonly accepted "Guide to Buying A New Kitten" that are written in books and the internet. We do not give cattery visits/tours to those that come to our house to see our kittens. We feel this is, to be succinct, an invasion of our privacy and a risk to our safety. But there are a number of other reasons why we do not give "tours." Many "pet buyers" often plan their day visiting a number of catteries. They do not take the time to change clothes and/or wash their hands between catteries. Thus, any possible contagion they might have picked up at the preceeding catteries could be spread to our entire population in a matter of minutes. The kittens we show to them for sale are generally kept isolated from the rest of our cats for that reason. Keeping litters of kittens separate until fully vaccinated. Just like toddlers in a daycare, kittens can spread infections faster than wildfire. And this can be deadly to the kittens. That being said, enclosures should be large enough that the cat move around, preferably have shelves as well as floor space. CFA recommends 24 square feet of floor for each cat. Floor space is more important than vertical space - so called "tokyo cages" that have a very tiny floor and a number of shelves are actually very poor enclosures for cats. It's not unreasonable to ask to see the parents, but keep in mind it might not always be possible. Finally, we feel that our house is still a private residence. We are not a business, and even if we were, no business would let you see their entire premises. If you are able to visit a breeder in their home, take time to inspect the kittens/cats you do see. They should be clean and healthy, as well as perky (though they might be somewhat hesitant at first meeting you.) You should expect that the parts of the home you are able to see should be cleaned and neat. Since the breeder knew you were coming, they should have taken the time to neaten/clean up the public areas. If the house is dirty for a visit, you can imagine when guests are not expected, it would probably be far worse. There should be no strong odors, but it's likely that some cat might have just used the litterbox and some slight odor might be detected. But if you feel like the smell is going to knock you out, it is probably not the best idea to purchase a kitten from that location.